This project is from someone on Arkansas Backcountry.com. The directions are linked toward the middle of this forum, or you can just keep reading here. The materials that you will need are a empty coffee can, some kind of drill, 2 clothes hangers (the goldish colored metal ones), a .25in drill bit, and a bit about the size of the hanger wire (it was the third smallest one in my set, but the size is slipping my mind right now). 1.) With the .25 in drill bit, drill 16 evenly spaced holes around the side wall of the can at the base. 2.) Then drill as many .25 in holes as you feel comfortable doing in the very bottom of the can. 4.) Then cut three sets of two holes just above the .25 in holes around the can. These will be for you to put your hanger wire through to make a triangle that will hold the bottom plate you just cut out. 5.) Cut a hole out of the can that measures 1"x3.5" just above where the plate will set. This hole will serve two purposes. 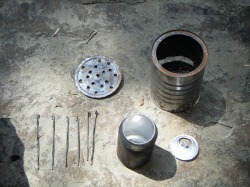 It will do a lot of venting, and it will be how you feed more sticks and twigs in when the initial material burns down. 6.) Finally, put three more sets of two holes around the center of the can. These will be the ones that hold your pot, and they should make another smaller triangle. 7.) If you haven't already, cut six equal lengths of wire from the two hangers. 8.) You can make a pot out of a smaller can. Just make sure it'll hold enough water for your boiling needs. NOTE: Depending on how you space these holes the three pieces of hanger wire will cross inside or outside of the can. The farther you space the two holes in each set apart, the smaller the triangle will be. Let me know if you have any questions at willky1@gmail.com. Thanks for reading and good luck!